The proposed HS2 rail route through the hamlet of Lower Thorpe will initially carry up to 11 trains per hour in each direction at peak times. Trains could increase to 18 per hour on the opening of Phase Two. Trains will be up to 400m long with 1,100 seats. Operating times will be between 5.00am and midnight on Monday to Saturday and between 8.00am and midnight on Sundays. Speeds of up to 360kph (225mph) are likely through our section of the route. The maximum anticipated noise level between 50 and 65db will extend far into the village. Banbury Lane may be closed for through traffic at Lower Thorpe for up to two years during the construction period. The Parish Council has been advised that information received from HS2 indicates construction of the Lower Thorpe viaduct and the cross-country haul route will probably start in 2019 and construction will take approximately 20 months. Environmental activity has already started. Photomontage of HS2 going through Lower Thorpe provided by HS2 in January 2015. Construction traffic is a major concern. HS2 propose to route construction traffic along Banbury Lane through Thorpe Mandeville village to the Lower Thorpe compound throughout the anticipated two year construction period probably starting in 2019. This has created great safety and environmental concerns. The Parish Council petitioned against the HS2 Hybrid Bill requesting noise and construction traffic mitigation. In January 2015 HS2 offered an Assurance to remove large construction traffic going through the village centre with the exception of the creation of the satellite work compound and a balancing pond in Lower Thorpe; a cross country haul route is proposed for larger construction traffic. A selection of HS2's maps for the parish can be found by using this link. There are several property schemes that directly affected people may be eligible for. Visit www.gov.uk/hs2 for full details. 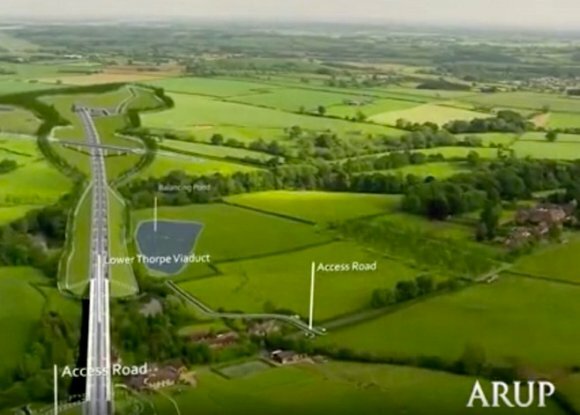 Thorpe Parish Council has been represented at many meetings regarding HS2 and it continues to attend the county council's regular HS2 Liaison Group meetings providing an insight into construction activities and plans. Lower Thorpe Mandeville nestles in a valley about 500 metres from the main village. The proposed HS2 high speed rail link will cross the lane on a viaduct with the loss of two houses including a Grade II listed farmhouse. The remaining three houses will be very close to the viaduct. The environmental destruction will be devastating to this peaceful setting, the wider parish and more generally, South Northamptonshire. Leaving our parish to the west, the HS2 route crosses close to the site of the Battle of Edgcote at Danes Moor. Greatworth tunnel will emerge east of our parish. 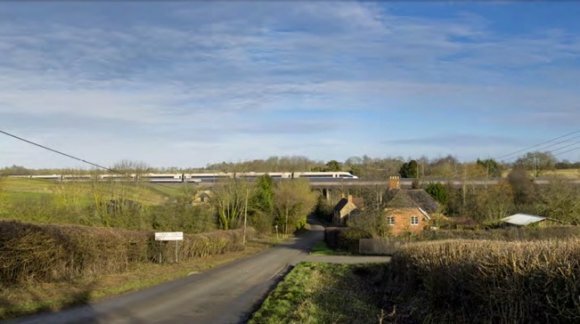 Below: A photograph taken from an HS2 'fly through' video issued in 2015. Thorpe Mandeville village is to the far right. The 200m viaduct over Lower Thorpe is in the foreground, where Lower Farmhouse currently stands. The bridge in the distance is Banbury Road between Magpie Farmhouse and Bulls Lane. HS2 disappears into Greatworth tunnel in the far distance.